Whether you’re seeking your first job or have been in the workforce for decades, employee benefits are likely important to you. They can make the difference in funding your retirement, paying for medical treatment and being able to take days off for vacation. 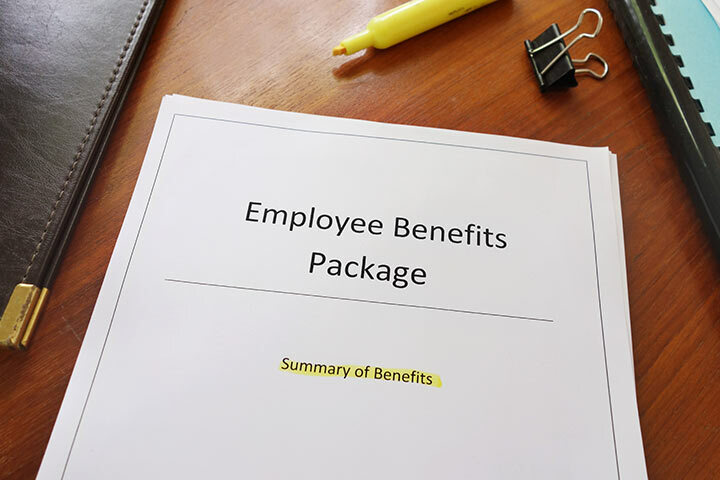 Even if you’re familiar with your employee benefits, you may not realize just how many benefits your employer could be offering. Read on to learn more about the 24 different employee benefits that you could be getting. Health care benefits vary widely by employer, with some offering only medical and others including both vision and dental insurance. For most people, a good health plan is at the top of the list when it comes to employee benefits. Having health coverage can be a financial lifesaver, particularly in the era of rising costs for both medical treatment and insurance premiums. Take a close look at the type of plan that your employer offers, including any options for different coverage. Review all of the potential choices to find one that fits your needs and lifestyle, and plan ahead to take advantage of everything your chosen plan has to offer, like free preventive screenings and discounted gym memberships. Many employers do not offer dental insurance, or if they do, it’s limited to cleanings and routine care. A good dental insurance plan will cover both preventative care, like exams, cleanings and x-rays, as well as treatment for cavities, root canals and other necessities. Most plans do not offer coverage for braces and other orthodontics. Review your dental insurance plan today to maximize your use of the benefits that are offered. Even if you don’t currently need glasses or contacts, most of us will require eye care at some point in our lives. Yearly eye exams are key to monitoring any changes in your vision, which can then be addressed as necessary. Carefully examine your employer’s vision plan to determine what expenses are covered, such as new glasses or prescription contact lenses, and which are excluded, such as surgery to correct your vision. Many plans have annual limits and lifetime maximums; be sure to take a look at these before making any plans for expensive treatment. Whether you want to go on a trip, spend a holiday with your family or if you want to stay home when you have a cold, being able to take time off is an important job benefit. Every employer is different when it comes to allowing employees vacation days. Many employers give workers a set number of days off per year that can be used for any reason. Others require employees to “earn” vacation days by accumulating time off based on the length of time that they’ve worked. If you aren’t familiar with your company’s vacation day policy, ask to review it. Look at the details of the plan, such as whether you are provided with vacation days for the calendar year or work year (i.e., based on the day of you hire) and if you can take vacation days before they have been earned. In addition to vacation days, many employers offer paid holidays off for their employees. Most companies give their employees at least six holidays off per year: New Year’s Day, Memorial Day, the Fourth of July, Labor Day, Thanksgiving and Christmas. Some may add other holidays, such as President’s Day or state-specific holidays. The notable exception is any employer in the medical and service fields, where employees typically have to work on at least one holiday per year. Many businesses have moved away from the idea of sick days, instead giving employees personal days to use as they see fit. A personal day can be used for any reason, from visiting family or meeting contractors at your house. When using personal days, remember that you may get sick and need to stay home from work, so don’t go too wild with unnecessary days off. Most Americans will not be able to retire on Social Security alone, which makes it all the more important to save for your retirement — ideally with retirement plans sponsored by your employer. This is the most popular type of retirement plan because it encourages employees to save for their own retirement by providing matching contributions up to a certain percentage. A 401(k) plan allows you to save for your retirement with tax-deferred growth, with limits on the amount that can be contributed each year and penalties for early withdrawal of the funds. Take a look at the details of your employer’s 401(k) plan to figure out when the company’s contributions vest and whether you can maximize the employer’s contributions by increasing your monthly deposits. Outside of the public sector, pension plans are less common than they once were, as they can be very expensive for employers. Also known as defined benefit plan, a pension involves an employer putting money into an account that accumulates over time. It is an excellent benefit that most employees cannot take advantage of, unless they work for the government or a public utility. Profit-sharing is a more unique type of benefit that is dependent on how well the company performs. It can be a very advantageous benefit, if the business is doing well and is expected to continue to be profitable. Management usually sets the amount of profit-sharing for employees, which can change depending on how well the company is doing. As a general rule, stock options are reserved for high-level executives. However, some employers offer Employee Stock Option Plans, or ESOPs. These plans allow employees to purchase company stock at a discounted price — usually 10 to 15 percent below market value. ESOPs sometimes allow for commission-free purchase and sale of stock. Examine your company’s offerings to see if you are eligible to purchase stock, but be sure to not invest too much in any one place — including with your own employer. Beyond health insurance, many employers will insure their employees to protect them in the event that they die or are disabled. Particularly for employees with minor children and spouses, life insurance is a valuable benefit. It will also help to cover basic funeral and end of life expenses in the event that something unexpected and tragic occurs. To supplement this insurance, consider purchasing additional life insurance on your own, or through a company-sponsored plan. In addition to life insurance, some employers offer accidental death insurance, which is essentially a larger payment if you die due to an accident. If this is offered at no charge to you, take advantage of it, but it is not usually a good idea to pay for this benefit or purchase it on your own. Many companies offer both short-term and long-term disability insurance, which is an incredibly important benefit that most health employees don’t think that they will ever need — until they get sick or have an accident. Both short-term and long-term disability insurance provide a percentage of your salary for a period of time. The length and amount of the payments will depend on the specific plan chosen. If employees often travel for business, their employers may offer business travel insurance. These policies will provide a payout for accidental death or dismemberment if it occurs while you are traveling for work. If your employer covers the cost of this insurance, you should sign up for it, but there is no need to purchase or pay for this on your own. In a competitive job market, employers are offering more unusual benefits in an effort to attract and retain top talent. Read on to discover some of the most common. If you are interested in pursuing a college or graduate degree, ask your employer about tuition reimbursement programs. Some companies offer tuition benefits for their employees to get degrees in a particular field, so you may be able to finance your education in part through employer contributions. Just make sure that you are able to handle the coursework on top of your regular work hours and be sure to calculate how this benefit will impact your taxes. Some companies, particularly in the technology sector, are now offering student loan repayment programs. While the monthly amount is typically low, even paying a small amount over the minimum due each month can help you pay off your student loans more quickly. In an effort to reduce health insurance premiums and improve their employees’ health, some companies are now offering free or discounted gym memberships to employees — or even building on-site exercise facilities so employees can squeeze in a workout before work, at lunch, or after work. Work-life balance is more important to employees than ever before, and employers are responding to that need with benefits like stipends for child care and elder care or offering child care at the office itself. If your employer does not offer a stipend or on-site child care, they may provide another program, such as a pre-tax account for dependent care expenses. Life is complicated, and employers are increasingly recognizing that reality with benefits like employee assistance programs. EAPs are designed to help employees with any number of issues, from addiction to mental health to crisis support and even financial planning. Depending on where you live and work, parking may be expensive. Some employers now offer parking reimbursement to help offset the cost of a monthly parking bill. While the monthly benefit amount is usually low, it can add up over time and help you save money. If you live in an area with a good public transportation system, your employer may pay part of your commuting expenses. This may come in the form of a stipend for a train or bus pass, a company van service or even benefits for employees who carpool. In the age of smartphones, we are all more connected to our jobs than ever before. Recognizing that reality, some companies offer cell phone reimbursements, particularly if carrying a cell phone or having access to email is a requirement of your job. Your employer may only pay for a portion of your bill or ask you to track or limit personal usage, but with the rising costs of cell phones, this is still a substantial benefit. Benefits can also include additional compensation for the hours that you work, or being reimbursed for business expenses. Even if you are on a salary, your company may still compensate you for hours worked above a standard workweek or for travel. Alternatively, they may give you comp time, which converts extra hours worked into vacation hours. If you pay for business-related costs, most employers will reimburse you if the item is directly related to your job. This may include mileage on your car for business travel or entertaining clients. However, the rate of reimbursement and limits on what will be paid can differ substantially. Check with your employer to find out how you will be reimbursed for business expenses. Contact The BBG for more information on employee benefits.